I don’t know about you guys, but last week was a rough one! That’s what happens when you take a break and potter about at home in your pajamas or leisurely sip lattes and cappuccinos at your local coffee shop without a care in the world. Chatting about coffee beans and roasters with your local baristas, exchanging coffee beans and sampling brew upon brew is all fine and dandy, but then eventually you realise that your free time has come to an end and you have to get back to work. Yes, I was scrambling to get a menu ready, shop and prep my demo for a industry partner event last week. It didn’t help that they didn’t get back with a head count till the day before the event and I was fretting about getting all my shopping done. Shopping bags in hand, shopping list at the ready, I headed into my local Whole Foods to get on with it. I am thankful for the folks at Whole Foods Bradburn who know me so well now and are always at hand to help. It’s nice to be known by name and to be acknowledged as soon as I enter the store. They make a mundane task all the more bearable. The week was just a hectic one; and on top of work, menus and shopping, I decided to throw in a dinner party. What was I thinking? You don’t think about what’s all on your calendar when you plan something 2 weeks out! My Kitchenaid rep and I were talking about something or another, and before I could think it through, I had invited him and his fiancée for dinner. I couldn’t leave it well alone and ended up adding 2 guys from work and their fiancées and the Lynx grill rep too. So yes, we had quite a few adults plus all these little kids! It was a wonderful evening though and the adults and kids both enjoyed it. I had a great time. It’s been awhile since I entertained and though I was tired after a hectic week, it was a great way to unwind and chill with friends. This grilled tandoori lamb I’m sharing today was on the dinner party menu, along with a few other Indian dinner party favourites. But before I get to the lamb recipe, I wanted to share my evening at the Uncorked Kitchen evening I attended a couple of weeks ago. I mentioned a couple of posts ago that Uncorked Kitchen is a kitchen (or rather a couple of kitchens) that offers cooking classes for couples, groups, kids; birthday parties; corporate events and so on. They have a chef who leads the classes and you cook along with him. Our set up was a little different because we went with a large work group and it was to learn about and see in action, the BlueStar ranges and ovens that equip the kitchen and can equip your home kitchen if you are so inclined. These ranges and ovens are pretty impressive. The power from the burners is amazing. At high altitude regular gas burners can struggle and there is a loss of energy, but BlueStars are calibrated for high altitude and there was no loss of energy here, these things were HOT. We also pan seared some steaks and finished them off in the oven, and broiled some steaks under the infra red broiler in the range. All came out delicious but I liked the one from the broiler. All in all, out was a great experience to cook at Uncorked and try out the BlueStar line of appliances. The owner of Uncorked Kitchen was our chef and he was incredibly gracious and helpful. Thank you to my event coordinator Janel for these photos. So, back to this lamb. Yes, I still make lamb even though I don’t care for it and never eat it. I did try a nibble because you have to if you’re going to be a good cook! Believe it or not, it did not taste too lamb-y to me and I almost liked it…..almost. The thing is, it is good. My husband was raving about it; it is tender, flavourful with the right amount of spice, and grilling it adds a layer of smoky flavour. I would’ve preferred to grill it on charcoal but since I was already knee high in other dishes, I let the gas grill take care of it. The gas grill does a great job, charring it on the outer edges perfectly and lending it that lovely, smoky flavour. Smoky, charred tandoori flavoured lamb from the grill. In a bowl, add the yoghurt, garlic, ginger, spices, and the lemon juice and mix well. Smear the yoghurt mixture all over the lamb. Cut a few little slits in the meat and smear the marinade into the slits. Rub all over the meat and massage well. Place in a large bowl, cover and place in the fridge to marinate for about 8 hours. Remove from the fridge an hour before grilling. Prepare the grill to a moderately high temperature, 400F. Drizzle oil over the lamb, salt and pepper and place on the grill. Grill for 15-20 minutes on one side, and then flip and cook 15 minutes on the other side. A temp probe should read 130-140F for medium rare. Allow to sit for 15 minutes before slicing. I prepped the lamb in the morning and let it sit in the marinade till right before the guests came. It was in the marinade for a good 8-9 hours; plenty of time for the flavours to absorb into the meat and the lamb to get nice and tender. Your piece of lamb should be a nice even size and shape to ensure even cooking throughout. It shouldn’t take more than 15 minutes on each side to get a nice medium rare. My piece was all uneven. I had thick bits and thin edges and tried my best to butterfly the piece as evenly as I could. Luckily for me, the uneven size of the lamb meant that everyone got a bit they liked, some liked it quite rare, some just a little pink and some just cooked through. The great thing about this lamb is that even when it’s cooked through, it’s very tender thanks to the marinade. As you can see in the photos, this piece is almost cooked through with just a hint of pink. It was still incredibly tender with great flavour. The lamb is great alongside a plate of Indian classics like butter chicken, saag paneer and naan or strewn on some pita bread or naan with a dollop of cucumber yoghurt to make a wrap. Hope your week has been less hectic than mine! I have a normal week this week and I’m taking Saturday off to spend time with my husband on his birthday weekend. I booked us a room in downtown Denver, made reservations at a French bistro for dinner and we’re going to take it easy and enjoy some museums. I hope he enjoys it. I’m looking forward to it!! I am making my way through your blog posts and if I haven’t got you yet…I will! Have a wonderful week my friends! Scrumptious! I love these luscious flavours and spices. Perfect when served with naan. Rosa recently posted..THE DIVINE IS IN THE DETAILS. OPEN YOUR EYES. Nazneen, thanks so much for sharing your experience at Uncorked Kitchen! 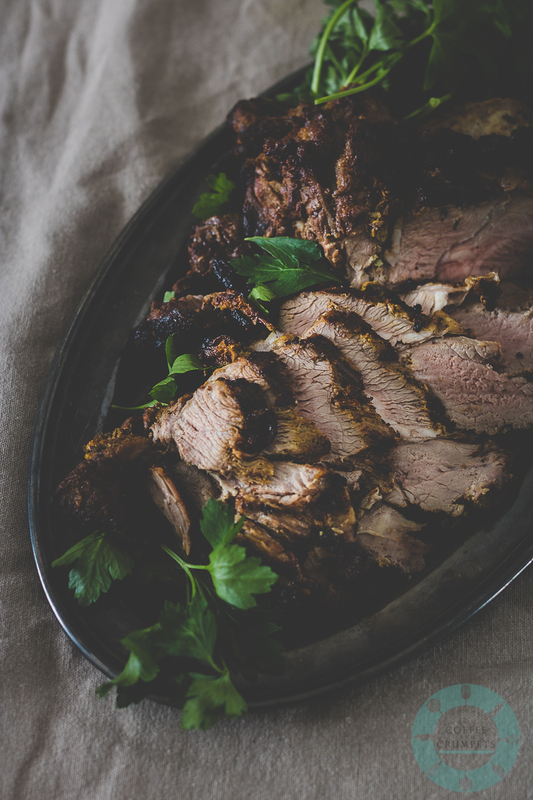 And I see why your husband was raving about this lamb – with that spiced yogurt marinade it sounds incredible! I have to say I was shocked when I saw “lamb” and “Coffee & Crumpets” in the same sentence! 🙂 You know that I love lamb, so I will be making this and reporting back. I love that you use boneless leg, as bone-in has always been so difficult for me. Your evening at the Uncorked Kitchen looked like a lot of fun! Mouthwatering photos as usual! This looks amazing. So sorry I missed it. I worked with Lauren last night and she said she couldn’t remember the names of the dishes you served but she loved each and every one. She also went on and on about how sweet and kind your son was to her little one. Gotta love a kindhearted young man. Cheers to his parents! Thanks Karen! We missed you last week. It was a really nice evening and I really liked Lauren. I’m so glad she enjoyed it. I was busy taking time to talk with everyone so couldn’t spend as much time with her. Cooper is adorable and I was just taken by the little guy, as was my son! I don’t eat much meat…and have never cooked lamb…and don’t even own a grill…:-)) So delicious served with flatbread. Oh dear! Well, this one just isn’t for you!! Love lamb! And love it on the grill. I usually use an olive oil, lemon juice, and soy sauce marinade (with spices and herbs, of course). Like your marinade, a lot. Definitely something I should be doing — thanks! Thanks John! Grilled meats, can’t go wrong with them! Hope you try this one, it did get rave reviews! I’m having an Indian dinner party in a few weeks time! How timely. Now don’t look askance at me – I always do tandoori lamb but I use a paste so this time I’ll use your spices. I normally roast it in the oven but I’ll stick it under the grill instead. I’m not making my own naan breads though!! Hmmm…maybe I should. Even I don’t make my own naan for parties! I’ll make them at home once in awhile but we can get pretty decent ones at the stores these days. Hope your party owe well! !